The greatest portrait painter in the world? Acclaimed master of the self-portrait, forty of which survive today. Rembrandt’s paintings will forever change the way we experience an artist’s self-portrait. Rembrandt revealed much more than his likeness in the paintings. He painted his turbulent life for all to see. The masterly portraits painfully expose the young man’s passion and recklessness, the middle-aged man’s haughtiness and sense of self-importance and the old man’s disillusionment. 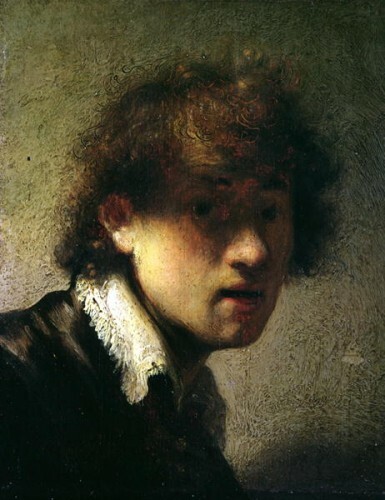 Rembrandt, son of a miller of very modest means, arrives in Amsterdam full of ambition and hope. “The most famous artist in Amsterdam.” He marries Saskia, a woman of good family, who bears 4 children. Rembrandt lives extravagantly, beyond his means. Personal tragedy and financial woes strike. Three of Saskia and Rembrandt’s children die and Saskia soon follows. Rembrandt is involved in court battle with his surviving child’s nurse (and his mistress), where he is sued for breach of promise. Rembrandt’s grandiose lifestyle results in a forced sale of his house and most of his possessions. 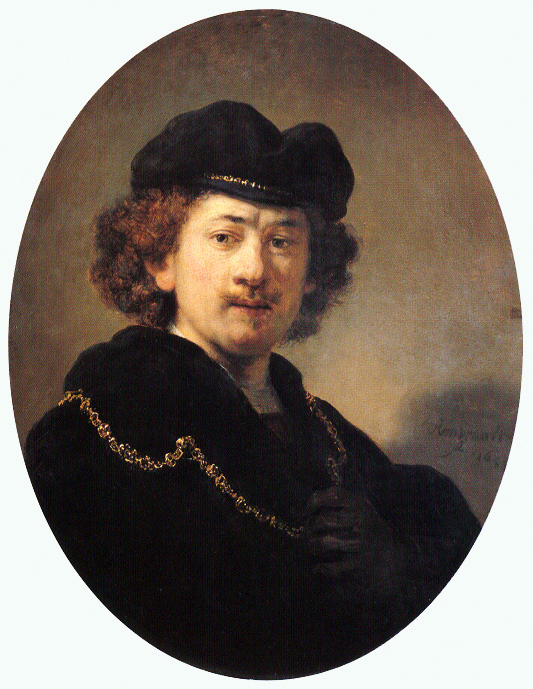 1669: Rembrandt dies at age 63 and is buried in an unmarked grave in Amsterdam. 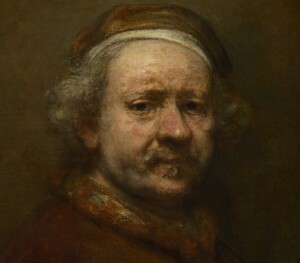 2013: A newly discovered Rembrandt self-portrait is valued at $30 million. Question to ponder: What would your self-portrait reveal? Watch this video for a breathtaking trip through Rembrandt’s life! Click here if unable to view the video. Kirby, THANK YOU!! I especially liked this one on Rembrandt. My dad was a collector of etchings. Upon his death I got his favorite etching – Rembrandt with Saskia (Third state of 3) and for my bday one year we went to a gallery here and he bought for my gift that year a Rembrandt etching of the Writing Master which was a recueil published by H. L. Basan. It was from the 6th state of 6. Awesome, Kirby, thank you. That’s a keeper and really great food for thought, especially after a morning of painting faces. Much to learn from the master. Kathy, i cked out your website, & I would say your portraits definitely capture the emotion of your model! Thanks, Kirby. His painting is incredible, isn’t it? But reading your words and then seeing the progression of his life made me sad. Sad for him. Also seeing the changes in him provoked my thoughts about myself and mostly how I want to connect with as much optimism as I can as time marches on. Your thought on “connecting with as much optimism as you can as time marches on” is a self-portrait in itself! Fabulous! Watching the fluid transformation of youthful insouciance to adult disillusionment through the changing of hats, nose and facial hair is sobering, clever and insight-full. Although I do not pretend to be a painter, I sometimes do wear a hat. I wonder if my sartorial changes are as revealing as Rembrandt’s. Hopefully not. Thanks once again for a truly provocative blog. a hat is a hat is a hat! A true master of portraiture. Brilliant, precise, unerring transfer of life-like image to canvas. Tortured life. Self destructive and chaotic. So, having many of the characteristics of genius he suffered the consequences. As for my self portrait. No problem. It will never happen. how talented you are and how much money you make. But he sure was gifted!!!!!! Yes! And that process begins today, don’t you think? I really enjoyed your Rembrandt blog. Last week I was at a Rembrandt exhibit in Mérida, Mexico and in July Anita and I attended an exhibition of 17th century Dutch paintings in Atlanta which featured Girl with the Pearl Earring and paintings by Rembrandt. Timely blog. As I viewed the video (more than once) I was captivated by the eyes. They pierced the canvas and demanded that the viewer return the stare. It is interesting that the eyes never really age. This blog was a reality check and I appreciated the thoughtful approach to life through your self-portrait theme. I did a self portrait about 15 yrs. ago & haven’t done another since because Friends talked for yrs. about how ugly I made myself. I knew it was just a good likeness. And it really wasn’t ugly. I didn’t think it would be cool to make a real “pretty” self portrait. At any rate, I’m inspired now by the master to do another. Since I’m 66 yrs. old, maybe I can get away with a not too “pretty” portrait. Thanks for the great video! I loved the video . It was fun. He started out giddy youth-all things open for him, definitely looks pompous when he’s feeling good. At the last, he just looks weary. As an artist you open every day to a new idea or way of doing something new, but the realizatin comes that you have less days. He left beautiful works and for that I am very grateful.